I mean my love for Pastels and Converse! Of course I do absolutely adore high heels, which I am sure you have noticed based on my constant blogging about killer heels, but during the day when I am running around London it is all about flat shoes. Hence my love for Converse – nothing suits my style better (despite pretty large collection of cute ballerina flats of which my favourites are by Tory Burch). 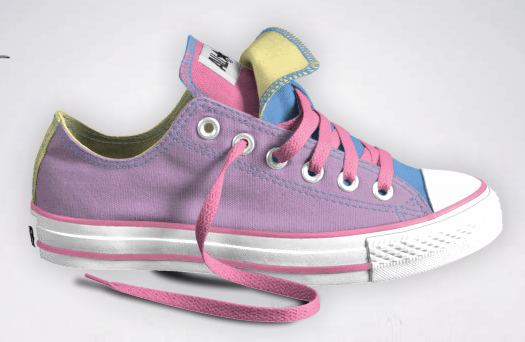 And since new season is all about pastels, it is time to update my Converse range with oh-so-fashionable colour palette! This could not be easier as on Converse website you can design your own perfect shoe – anything from shape to patterns and colours of every single part of the shoe. You can even get your own name sewn into the design. So above are my beautiful Converse I just ordered that will be with me in 3-4 weeks, just in time for good Converse-friendly weather, I hope. All I need is one of those American Apparel Pouches I added to my pastel wish list a few posts back and I tick all the trend boxes! Create your own here. The pair above is £54. You are currently reading My Two Big Loves at MY FASHION WISH LIST.